How do you transform a two-time college dropout into a Dean’s List student? Give her a bridge and a foundation. Walk her over and shore it up. 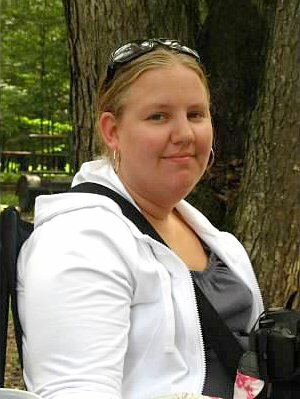 In 1998 Lindsey Grice enrolled at NMC, fresh out of Traverse City Central High School and mother to a newborn daughter. It didn’t go well. “I just failed miserably. It wasn’t something I knew about. I had a full course load and a little baby and it was too much,” Grice said. She tried again a decade later. By 2008 she was a mother to three, including a son with intensive mental health needs. Grice had to take six credits and earn a 2.0 in order to keep her financial aid. Her attendance was spotty due to her son’s care giving demands, and she did well in one class but not the other. She lost her financial aid and dropped out a second time. Fast-forward to 2014. A friend told Grice, now 34, about NMC’s Bridge program. Created for nontraditional students attending college for the first time or returning after past attempts, Bridge endeavors to lay a foundation for student success. Just last year, the program was redesigned so that what were formerly preparatory classes are now for-credit. Significantly, that makes Bridge students eligible for financial aid. NMC Student Success Coordinator Ashley Darga walked Grice through the process of petitioning to reinstate her financial aid. Regulations have changed to favor students like Grice, Darga said. “I was able to get my Pell grant to be able to take classes this fall,” Grice said. Her foundation steadied. Almost simultaneously her son Brandon, now 15, entered a residential school, further firming her foundation. Finally, her daughter Ashley—the newborn during Grice’s first college stint—now 16 and a high school junior, threw down the gauntlet. That challenge completed the foundation underpinning Grice’s turnaround. Bridge students take nine credits (five classes) their first semester. Grice earned a 4.0 and made the dean’s list. “I think I was really determined this time,” she said, citing one class, Academic Study Methods, as a key. Instructor Shannon Owen said transforming students from passive to active participants in their education is another crucial piece of college success. “They have to advocate for their own needs. We don’t know they’re struggling or that they don’t understand concepts,” Owen said. Grice started out strong and only improved over the semester, turning in assignments early, Owen said. Grice’s long-term aim is a business management degree. More immediately, she’s focused on next semester’s classes, especially English 111. It will be the fourth time she’s attempted the class. This time she’ll have a study partner: daughter Ashley, registered in the same course as a dual-enrolled student. “It’s hard for me (but) I am ready for it,” Grice said.